If you create multiple filter expressions, the type of "Join" is selectable. An "AND" linking will return only data records that fulfill all criteria, and an "OR" linking will return only the data records that fulfill a minimum of one criterion. First, select the data group, from which the values are to be filtered. The filter can also use data fields from a higher or lower data group level, i.e. parent or child data groups. The data field will be defined in the "Data field" drop-down list. All data fields of the current application, including reference fields, can be chosen. Equal Every string that is identical with the comparative value. This is case-sensitive. Unequal Every string that is not identical with the comparative value. This is case-sensitive. Less than or equal Every string with a smaller or equal character values (ASCII) as the comparative value. Less than Every string with a smaller character values (ASCII) as the comparative value. Greater than or equal Every string with a greater or equal character values (ASCII) as the comparative value. Greater than Every string with a greater character values (ASCII) as the comparative value. Undefined Every dataset whose data field does not contain a valid value or has not yet been initialized. A comparative value does not need to be defined for this operator. Defined The data field contains any random value. An empty string is also valid - e.g. when saving without an entry. A comparative value does not need to be defined for this operator. Contains All string that contain the comparative value. Starting with All string that start with the comparative value. Ending with All string that end with the comparative value. Is contained in All strings that appear, even in part, in the comparative value. If the string delivered by the data field is identical to the comparative value, no result will be returned. Multiple values can be separated with ||. Is not contained in All strings that do not appear, even in part, in the comparative value. Multiple values can be separated with ||. The operators "Less than or equal", "Less than", "Greater than or equal", and "Greater than" offer special usefulness when filtering customer or product numbers that are made up of number and letter strings. With the number “C1000”, the ASCII value of the character string can deliver smaller numbers. The capital letter "C" has an ASCII value of 67, the number "1" has the value 49, and the number "0" has the value 48. The operators named above compare ASCII values lexicographically. With the operator "Less than", all numbers that are smaller than "C1000" will be returned ("C999, C998, "etc.). In order to deliver data sets that possess no entry in the data field, a query must be made with an "OR" link, i.e. whether the value of the field is "NULL" (operator: "Undefined"), or whether the entry is empty because no entry has been saved. In order to return an empty string, select the operator "Equals" and set the comparison value to " User-defined". The "Character string" field will remain empty in this case. If all fields will be filtered to return entries (no empty string and no "NULL"), the filter must be run in this way with an "AND" linking. Is contained in The same as operator "Equals"
Is not contained in The same as operator "Unequal"
Is contained in tenants Is only available for selection if the UserID or a GUID from the Users application has been selected as the data field. It can be compared with the system values "Selected tenants of current user" and "All tenants of current user" to filter the current data by the tenant(s) that area assigned to the current user. Click here for more information. Undefined Fields with the value "NULL"
Defined Fields with either the value "True" or "False"
This setting can be activated for the operators "Contains", "Begins with", and "Ends with". This will identify all data fields that do not match the filter. Here, a data or reference field of your choice can be chosen for comparison. Comparing fields is only possible with fields of the same data type. Returns every data record that contains the current value of the selected data field from the specified ReadContainer. Opens a dialog where data fields from a parent data group can be selected. This button is only available if the data group, which is use in the selected ReadContainer, has a parent data group (or higher). Together with the operator "Is contained in", a list of the deputy IDs of the current user will be delivered. Deputies can be assigned to users in the portal's User manager. Compares with the gender of the currently logged-in user. Together with the operator "Is contained in", a list of the superior IDs of the current user will be delivered. Superiors can be assigned to users in the portal's User manager. Compares the ID of the current user for example for showing the records created by the currently logged-in user. 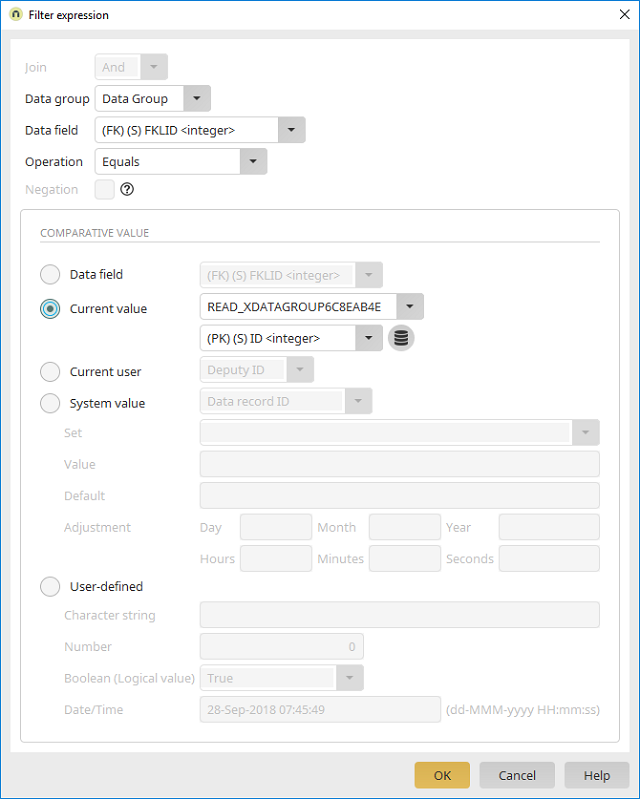 If a data field is selected that does not have the type integer, a comparison can be made here with the corresponding fields from the User manager. The selected data field will be compared with the ID of the currently displayed data record. The selected data field will be compared with the ID of the superordinate data record. Compares the currently displayed data record with the value of a request variable. Enter the name of the request parameter here. Enter the default value that should be used for null values. Compares the currently displayed data record with the value of a session variable. Enter the name of the session variable here. The default value is used when the session variable is not defined. Compares the currently displayed data record with the value of a variable from the processing context. Enter the name of the variable here. The default value is used when the variable is not defined. With the operator "Is contained in", delivers data records from users who are contained in the set. With the operator "Is contained in", delivers data records from users who are contained in the container. Used with the operator "Is contained in tenants", it returns the records that are contained in the tenants selected by the current user. Click here for more information. Used with the operator "Is contained in tenants", it returns the records that are contained in every tenant assigned to the current user. Click here for more information. If the selected data field is a datetime data field, the value of that field can be compared with the current date. You can find out more about adjusting dates here. Please note when filtering time periods that a day always begins at 0:00. If you would like to filter the period of 01/08 until 05/08, the filter expression must be ">01/08 and <06/08" so that 05/08 is included in the filter. (HRef of the folder tasks). The comparison value "Language" will filter the table entries depending on the language setting of the portal. A requirement of this is that all data fields that will be compared must have a language key (such as "de", "en") for every data record. The comparison value "Layout" will filter the table entries depending on the current layout of the portal. As user-defined, static comparison values, any character string can be entered to compare string data fields. Please note that capitalization will be considered here. Integer and float data fields can be compared with a number. Datetime data fields can be compared with a date.